Have you heard of Shakespeare Under the Stars? Also known as the Antioch Shakespeare Festival, it was created by Arthur Lithgow and Meredith Dallas at Antioch College in Yellow Springs, Ohio, in the 1950s. The Folger’s Shakespeare Unlimited podcast features an episode about this landmark festival, interviewing the founders’ children — including the Emmy, Grammy, and Tony Award-winning actor John Lithgow — about their fathers’ work and legacy. 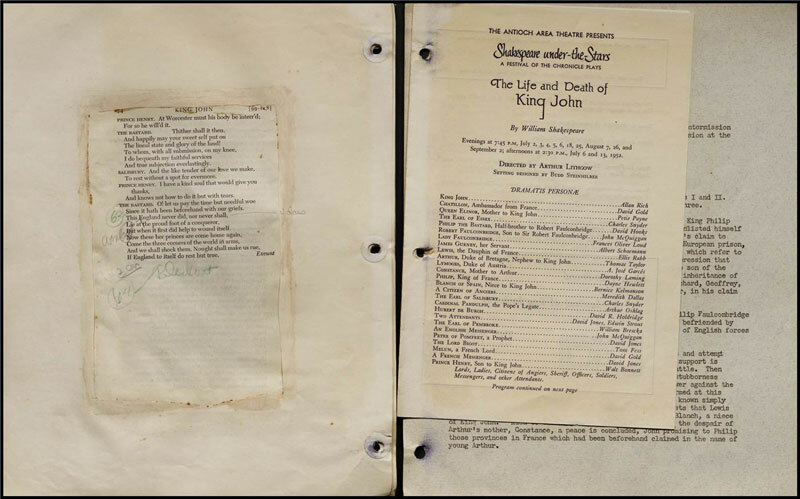 The Folger collection contains a number of prompt books from the festival’s Shakespeare productions, which were gifts from Arthur Lithgow. 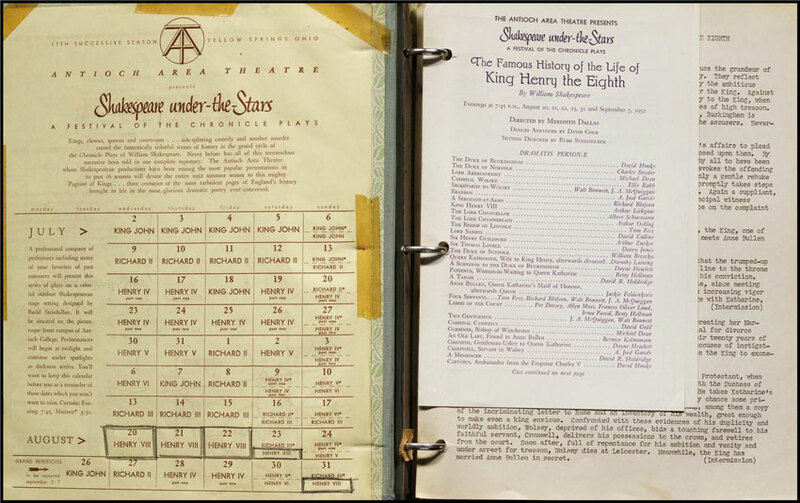 The digitized copies can be found in Shakespeare in Performance: Prompt Books from the Folger Shakespeare Library, a database that is available onsite at the Folger or by subscription elsewhere. What is a prompt book? “The prompt book is the production’s bible, containing a wealth of instructions and information alongside the basic text of the play,” as an introductory article on Shakespeare in Performance explains. King Henry VIII prompt book. Shakespeare Under the Stars Festival. Folger Shakespeare Library. King John prompt book. Shakespeare Under the Stars Festival. Folger Shakespeare Library. Prompt books often contain notes about casting, movement about the stage, lighting and sound cues, and even what props will be used. 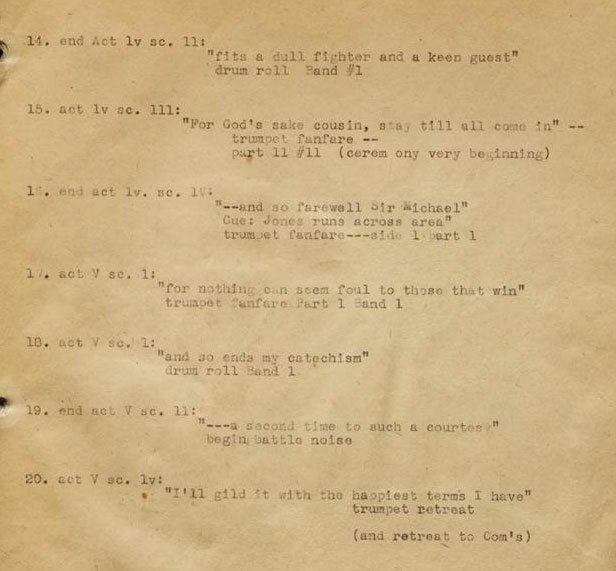 Note the drum rolls and trumpet fanfares in the notes below from a prompt book for an Antioch production of Henry IV, Part 1. From a prompt book for Henry IV Part 1. 16 Jul – 4 Sep 1952. 1 Hen IV Fo 4. Folger Shakespeare Library. 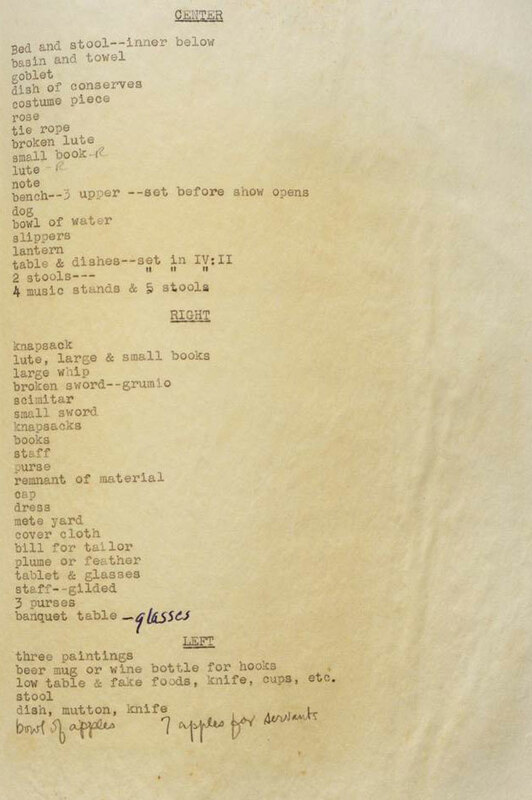 This prop list was included in one of the Antioch prompt books. Can you guess which Shakespeare play it’s for? ‘This Antioch, then, Antiochus the Great/Built up, this city, for his chiefest seat/The fairest in all Syria’ from the Prologue, spoken by Ancient Gower, to Shakespeare’s ‘Pericles’. Not, let us hope, considering the scene (and its consequences) following the Prologue, this ‘fairest seat’ of Antioch, U.S. !